Sweden and Poland failed to qualify for today’s second round and as the 10-nation series moves towards the half-way point at the Dutch venue, the Polish team has still not picked up any points and is joined in the bottom-four relegation zone by the Swiss, the Swedish and the Dutch. Course designer, Rolf Ludi, put a lot of pressure on today’s competitors with a tight time-allowed that was slightly adjusted after the first few horses completed the track in the first round. “The difference for us is that speed is not a problem for our horses, and that our riders are good at jumping fast rounds,” pointed out the proud French team manager, Laurent Elias, afterwards. They were also able to cope with the testing run from the big open water at fence four to the following FEI vertical at five, as well as the difficult offset line that included a triple bar followed by a water-tray oxer and then an all-too-fragile set of white planks. The Meydan triple combination, just one obstacle from home, claimed a large number of victims – mostly at the oxer middle-element which was very wide. However the biggest surprise of the day was the influence of the opening oxer which fell seven times in the first round and which also brought the first-round contribution of Dutch anchorman Marc Houtzager to an end, even before it began, when his feisty stallion Opium dislodged him with a sudden stop. Despite a great anchor-ride five-fault result for Jan Chrzanowski and Just Cruising the Polish team clocked up 42 first-round faults and joined the Swedish side, which had collected 33, in the spectator-stand as round two got underway. There were now two separate contests – the first between the French on four faults and the Germans close behind with five, and the other between the remaining six teams closely bunched together with less then two fences between them all. The Americans, lying eighth with 22 faults, improved one place thanks largely to a clear from Richard Spooner and Cristallo at their second attempt, while Spain, fielding a completely new line-up, remained in sixth when adding 13 more to their tally. The Irish were carrying 19 faults from round one, and a clear from last-man-in Billy Twomey with Je T’Aime Flamenco allowed them to drop the 16 collected by Darragh Kenny and add just nine more which moved them up from joint-sixth to fourth. It was a deeply disappointing day for the Swiss however. They fielded their top side and wanted to put their best foot forward in front of their home crowd, but Steve Guerdat (Jalisca Solier) was the only one to jump a clear round while Beat Mandli picked up nine faults with Louis, Daniel Etter’s normally super-reliable Peu a Peu was way off-form when racking up a massive 32 and World No 1 Pius Schwizer collected 12 with Carlina. In contrast, the British enjoyed an excellent afternoon despite the loss of Michael Whitaker in the second round after GIG Amai was reported to be on the injury list following an uncharacteristically poor first effort. In his absence, his older brother John produced exactly what was needed when following Ben Maher’s clear with Robin Hood and Peter Charles’ four faults with Murkas Pom D’Ami by a foot-perfect tour of the track with Peppmill which secured third place. For the Dutch it was another disaster. The reigning World Champions failed to make the cut into the second round in Rome seven days ago and when obliged to count 24 more faults in the second round today had to settle for eighth place. The French were flying however and when both Kevin Staut (Kraque Boom) and Penelope Leprevost (Topinambour) produced double-clears then the writing was already on the wall. German chances of overtaking them were hampered by a mistake at the liverpool oxer at fence eight by second-round pathfinder Marco Kutscher (Cash) and although Carsten-Otto Nagel and Corradina stayed clear, four more faults from Ludger Beerbaum and Gotha gave the French even more leeway. Nicolas Delmotte’s Luccianno put a foot in the water but that was still good enough to ensure victory, so neither Olivier Guillon (Lord de Theize) nor Germany’s last man, Marcus Ehning, were called upon a second time. For Laurent Elias it was “mission accomplished” yet again, but there is nothing arrogant or over-bearing about his attitude to success. “We are never sure we are going to win but we go out there every time with the intention of doing it and all of the team give me everything – no team manager can ask for more than that” he said. He talked about the challenges presented to the show organisers following the torrential downpour on Wednesday night and further rain on Thursday that led to the cancellation of competitions. “A meeting with all the Chefs was called and I would like to thank the organisers for taking the right decision about yesterday’s classes – as a result we had a great competition and great sport today” he pointed out. Kevin Staut commented on Rolf Ludi’s course-building skills. “This was a clever course, and difficult too but it jumped well,” he said while Penelope Leprevost was delighted with her 10 year old Dutch-bred stallion Topinambour who is still in a learning curve at this level. “I am very happy because I still don’t have a lot of control when I have to go fast with him but he jumps so well – today he was able to complete the course with a clear round even though the time was very tight,” he added. With 30 points now on the board, the French go into the fourth leg of the 2010 Meydan FEI Nations Cup series with a 10.5 point lead over their nearest challengers, the British who have made a remarkable come-back this season. As the halfway-point of the series approaches, the biggest question now seems to be – can anyone beat the French? For further information on the Swiss fixture at St Gallen go to website www.csio.ch or contact Press Officer Peter Wyrsch at (Email) peter.wyrsch@sportinformation.ch, (mobile) Tel: + 41 79406 5207. 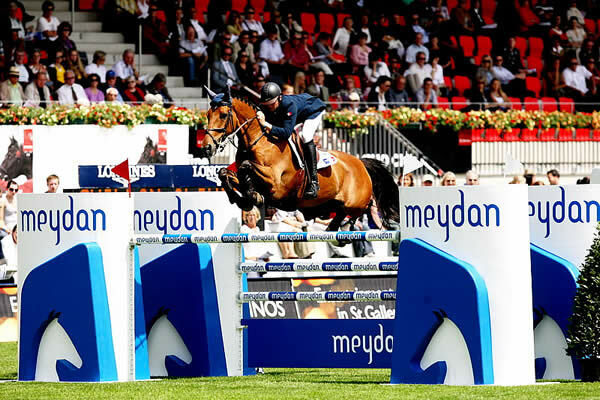 The NEXT leg of the 2010 Meydan FEI Nations Cup series takes place in Rotterdam, The Netherlands on Friday 18th June. For more information on the Dutch fixture, go to website www.chio.nl or email Press Officer Anita Lussenberg at press@chio.nl. 1. France 8 faults: Kraque Boom (Kevin Staut) 0/0, Topinambour (Penelope Leprevost) 0/0, Luccianno (Nicolas Delmotte) 9/4, Lord de Theize (Olivier Guillon) 9/4. 2. Germany 13 faults: Cash (Marco Kutscher) 4/4, Corradina (Carsten-Otto Nagel) 4/0, Gotha (Ludger Beerbaum) 1/4, Plot Blue (Marcus Ehning) 0/DNS. 3. Great Britain 19 faults: Murkas Pom D’Ami (Peter Charles) 1/4, Robin Hood (Ben Maher) 9/0, GIG Amai (Michael Whitaker) 17/DNS, Peppermill (John Whitaker) 5/0. 4. Ireland 28 faults: Carmena Z (Shane Breen) 5/5,Obelix (Darragh Kenny) 5/16, K Club Lady (Cian O’Connor) 9/4, Je T’Aime Flamenco (Billy Twomey) 9/0. 5. Switzerland 30 faults: Jalisca Solier (Steve Guerdat) 0/4, Louis (Beat Mandli) 9/5, Peu a Peu (Daniel Etter) 20/12, Carlina V (Pius Schwizer) 8/4. 6. Spain 32 faults: Guarana Champeix (Rutherford Latham) 2/9, Monark (Pascal Levy) 9/4, Rico Revel (Eduardo Alvarez Aznar) 18/5, Wisconsin (Sergio Alvarez Moya) 8/4. 7. USA 39 faults: Cristallo (Richard Spooner) 8/0, Rothchild (McLain Ward) 13/8, Mademoiselle (Beezie Madden) 9/12, Urico (Mario Deslauriers) 5/9. 8. The Netherlands 42 faults: Tyson (Leon Thijssen) 5/8, Audi’s Alpapillon-Armanie (Vincent Voorn) 8/8, Exquis Walnut de Muze (Harrie Smolders) 5/8, Opium (Marc Houtzager) Elim/9. 9. Sweden 33 faults in FIRST round: H&M Arctic Aurora Borealis (Peder Fredricson) 8, Glory Days (Daniel Zetterman) 16, LB Paola (Henrik Von Eckermann) 12, Caramell (Svante Johansson) 13. 10. Poland 44 faults in FIRST round: Castiglione L (Andrzej Lemanski) 29, Torado (Krzysztof Ludwiczak) 13, Castello (Aleksandra Lusina) 26, Just Cruising (Jan Chrzanowski) 5. This was the third consecutive victory for France in the 2010 Meydan FEI Nations Cup series – the French team previously won at both La Baule (FRA) and Rome (ITA). Sweden and Poland did not qualify for the second round of today’s competition. There were only two double-clear performances and both of them came from members of the French team – Kevin Staut with Kraque Boom and Penelope Leprevost riding Topinambour. Four horses jumped clear in the first round. There was just one elimination in today’s competition – Marc Houtzager from the The Netherlands who fell when his stallion, Opium, refused at the first fence. A Meydan FEI Nations Cup event is organised as a five-star Nations Cup, i.e. a competition in which official teams representing nations compare their merit. At each event the teams gain points according to their placing. At the end of the 2010 season the team with the highest points wins the Meydan FEI Nations Cup and the four teams with the lowest points are relegated to the FEI Nations Cup series (Promotional League). Following the Promotional League Final, the two best placed teams from that series join the Meydan FEI Nations Cup for 2011. The World’s Top 10 Teams: France, the USA, Germany, Switzerland, Ireland, The Netherlands, Sweden, Great Britain, Spain and Poland. La Baule (FRA), Friday 14 May; Rome (ITA), Friday 28 May; St. Gallen (SUI), Friday 4 June; Rotterdam (Ned), Friday 18 June; Falsterbo (SWE), Friday 9 July; Aachen (GER), Thursday 15 July; Hickstead (GBR), Friday 30 July; Dublin (IRL), Friday 6 August. The complete rules, latest news, results, standings and photos are on www.meydanfeinationscup.org. To learn more about the FEI go to www.fei.org. To learn more about Meydan, the title sponsor of the Meydan FEI Nations Cup, go to www.meydan.ae.